I'm ready to quit, how do I start? Current: I’m ready to quit. How do I start? Making the decision to give it a go is a huge step: well done! Before you dive in, here are some steps you can take to boost your chances of smokefree success. Our experienced Quit Specialists can give you advice and tips and help you develop a plan to quit. Also, speaking to a Quit Specialist actually makes you more likely to succeed at quitting! Request a Quitline callback. Ask your doctor about nicotine replacement therapy (NRT) products or quitting medications to help you deal with nicotine withdrawal. Using these with Quitline really boosts your chance of quitting successfully. The following are two of the most effective ways to quit smoking. Quitline with NRT combination therapy: patches plus a fact-acting NRT like mouth spray, lozenge or gum. Quitline with the quitting medication Champix (Varenicline). Call Quitline on 13 7848 or request a Quitline callback. 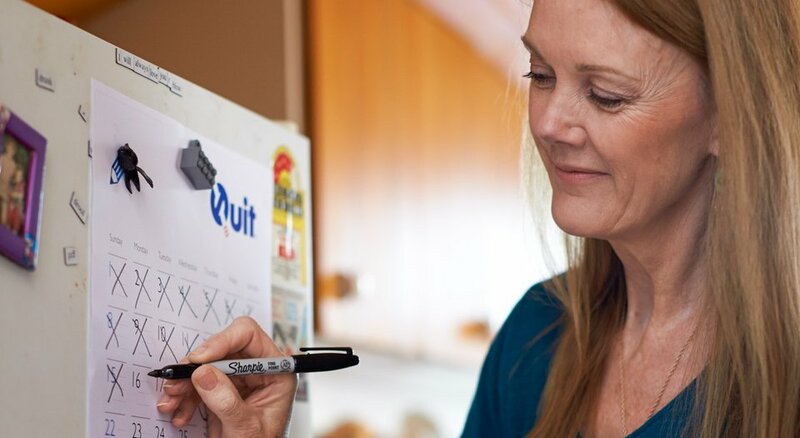 Setting a quit date can make you feel like you're taking control of the smokes. It gives you time to prepare. But if you don't stop on your quit date, don't worry. It's not a test. It's just a way of helping you focus and giving you time to put your plans into action. Just choose another time and have another go. Go here to read more about setting a quit date. Consider how you’ll deal with triggers, cravings and nicotine withdrawal before they strike. Change where you smoke. If you like to smoke while sitting down outside in the sun, try forcing yourself to stand instead of sitting and do it near the rubbish bin or in the laundry – somewhere you don’t particularly enjoy being. Change when you smoke. Like to have a smoke after dinner? Or with a coffee in the morning? Try to break this link by having that smoke before dinner or later in the morning without the coffee to see how you go. Make your car or home smokefree. Say no when people offer you a cigarette. Try some of our distract me tips. For help with any of these and more, call the Quitline. Or request a Quitline callback.